Tonight BBC Scotland are screening the first episode of their Addicted to Pleasure series. The first programme features actor Brian Cox looking at sugar. It might be great. 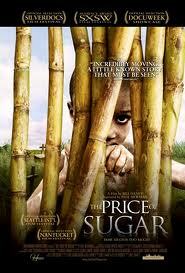 However it might not be, so here is a great documentary on sugar. The Price of Sugar looks at the Dominican Republic, a tropical island-nation, tourists flock to pristine beaches unaware that a few miles away thousands of dispossessed Haitians have toiled under armed-guard on plantations harvesting sugar cane much of which ends up in U.S. kitchens. They work gruelling hours and frequently lack decent housing, clean water, electricity, education or healthcare. Narrated by Paul Newman, the film follows Father Christopher Hartley, a charismatic Spanish priest, as he organizes some of this hemisphere’s poorest people to fight for their basic human rights. This film raises key questions about where the products we consume originate and at what human cost they are produced.